Killer whales have long been a source of legends and myths for humans. Also known as Orca whales, these sea mammals are the largest member of the dolphin family. These black and white carnivores are extremely intelligent and adaptable. According to us.whales.org, orcas can communicate and coordinate with each other to hunt more effectively. On a daily basis, orcas are on the hunt for seals, sea lions, fish, and squid. They need to do what it takes in order to get their meal. Although they have earned the threatening nickname the killer whale, orcas aren’t typically a threat to humans. There have even been stories of killer whales protecting humans from sharks. The female orca was spotted by one man who knew in his heart that he needed to help. He picked up the phone and called the animal rescue group Guardians from Hartley bay, British Columbia. Besides them, a few people from For Whales also showed up to help keep this stranded orca alive. Everyone at the scene was a volunteer. By the time she was spotted, the killer whale had already been stranded on the rocks for hours, the group’s Facebook post revealed. When the volunteers arrived, they covered the whale with tarps and sheets. Then they proceeded to douse her with water in order to keep her cool and wet. In order to be more effective, they assembled a water pump. This let them keep the whale wet without having to go back and forth with buckets from the water. The whale knew the volunteers were trying to help her, the animal rescuers said. And when she cried out in fear, their hearts ached. It is truly a heartbreaking scene to witness in the video footage below. Slowly the tide began to creep up. But it was taking too long and they needed to keep the whale wet. 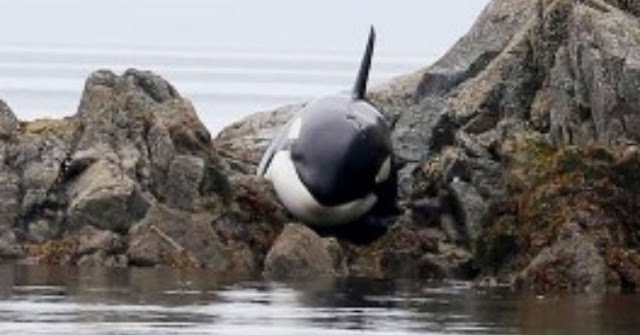 After more than 8-hours of being stranded on the rocks, the tide rose high enough and the orca was able to move and free herself from the rocks. The rescue group’s Facebook post offered a big thank you to every community member who came out to extend a helping hand. Watch the video below to see what it was like for these volunteers to help protect this helpless whale from a terrible death. Here’s what viewers like you had to say about the spectacular moment caught on film. What do you think about the video footage? Please tell us in the comments.